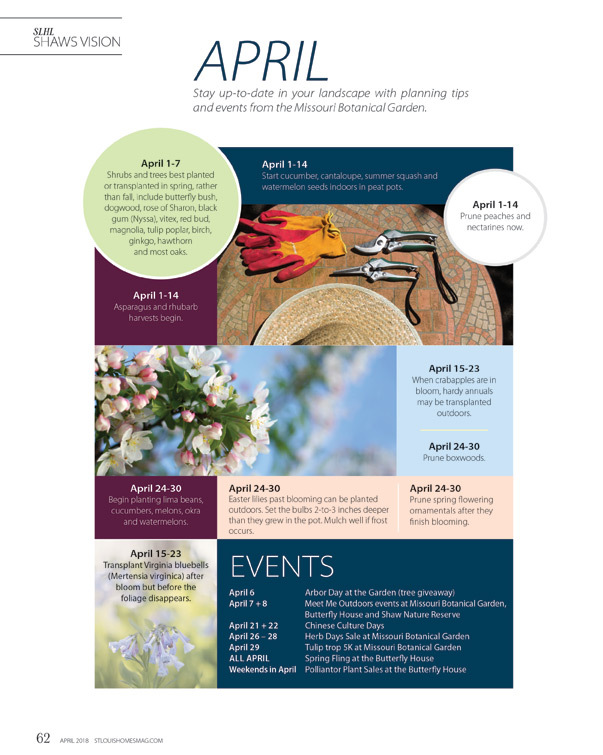 Stay up-to-date in your landscape with planning tips and events from the Missouri Botanical Garden. Shrubs and trees best planted or transplanted in spring, rather than fall, include butterfly bush, dogwood, rose of Sharon, black gum (Nyssa), vitex, red bud, magnolia, tulip poplar, birch, ginkgo, hawthorn and most oaks. Start cucumber, cantaloupe, summer squash and watermelon seeds indoors in peat pots. Prune peaches and nectarines now. Asparagus and rhubarb harvests begin. When crabapples are in bloom, hardy annuals may be transplanted outdoors. Transplant Virginia bluebells (Mertensia virginica) after bloom but before the foliage disappears. Begin planting lima beans, cucumbers, melons, okra and watermelons. Easter lilies past blooming can be planted outdoors. Set the bulbs 2-to-3 inches deeper than they grew in the pot. Mulch well if frost occurs. Prune spring flowering ornamentals after they finish blooming.